This morning the Fort Fido crew assessed Daisy. She is a four month old, thirty pound, orange and white colored, Beagle Mix. Daisy ventured to our Medium Roll play area where she blossomed. She is the quintessential puppy-dog... Cautious, yet curious, excitable, and full of energy. Here at The Fort, Daisy had a really good time. She is doing well at learning how to speak "Dog", and truly enjoys meeting other canines. Daisy's tail seemed to wag constantly while she socialized with the pack. She even got into some one on one play, with a few different canines. 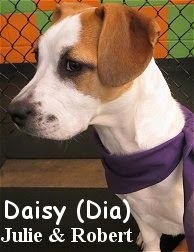 We hope Daisy swings by these parts regularly, given her age, she can get a lot out of Dog Daycare. First rate job today Daisy! Meet Charley, he is a handsome, seven month old, forty pound, black and nutmeg colored, Labrador Retriever and Standard Poodle Mix. Charley hasn't done too much socializing in his life, but lucky for him, that is all about to change thanks to his owner and The Fort. Upon arriving for his assessment this morning, Charley, wasn't quite sure where he was or why he was here. Under good voice control, Charley willingly strolled with us to the Medium Roll. There, he sat at attention, waiting to see what would happen next. Although he was a bit nervous, he really did a good job staying calm. As other dogs arrived and greeted him, Charley was hesitant, but certainly not scared, and by no means aggressive. Given some time and consistency, we hope that Charley will warm up to other dogs and relax into some pleasant social time. Seeing him play would be outstanding, and we know he has it in him, but for now he must take baby steps towards becoming a member of the pack. 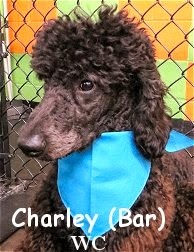 Charley is an incredibly good looking canine, in fact, I have never seen a Poodle Mix with markings quite like Charley's. His head, tail, and body, are your standard Poodle Black, while his four legs are a separate brown nutmeg color. It is really striking, he is one cool and unique looking dude. Swell job today Charley, we'll see you again, and you are more than welcome. "Extreme Cuteness" arrived in the form of a Shiba Inu Assessment, this last Saturday. Meet Thalia, she is a spunky, one year old, twenty pound, Sesame Shiba (red and black colored). Outside our place, Thalia, is good buddies with Medium Roll Regular and "barrel of fun", Louis. 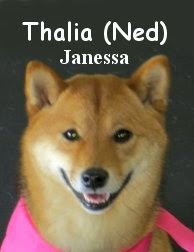 Like Louis, Thalia is a whole lot of fun, and is a lot like a few of our other Shiba Friends. She thoroughly enjoys socializing with the pack, and playing. On top of being quite a looker, Thalia will be an excellent inclusion to Fort Fido's Medium Roll. Man, if all of our Shibas show up on the same day, it'll be one high-energy day! This morning, "Extreme Cuteness", arrived in the form of a stocky, cuddly, baby bear cub-like pup, in for his Assessment. Meet Oliver! He is a three month old, twenty pound, black and chestnut colored, Bernese Mountain Dog and English Crème-colored Golden Retriever Mix. Oliver had a blast here today. He wiggled, wagged, frolicked and played his way into everyone's hearts haha. Oliver's only problem however, is that he may be too cute for his own good! What I mean to say is, too cute to correct, literally. Excuse me while I rant a bit... Sometimes, the real "cuddly-fuzzy-wuzzy types", can miss out on Strong Leadership and Corrections, just because they are so darn loveable. When this happens to a dog, especially a dog that will become large in size, behavioral problems can develop quickly... Seemingly going "from 0 - 60". You know how it goes, kinda like the cute little kid that "gets away with murder". With Oliver, one must constantly remind one's self, to look past his cuteness, and treat him like every other member of the pack... When your not cuddling him that is lol. This way, he'll communicate and fit in with other dogs properly, becoming a healthy and more well-rounded canine. We don't want "the cuties", like Oliver, to turn into People Possessive and or S.A. ridden dogs. I can assure you, there's no fun in that. Lucky for Oliver, he has a good owner that can do right by him. Anywho, Oliver did a fine job in here. Like Thalia, Oliver too, is welcome here at The Fort anytime. I know the crew can't wait to meet with him again. 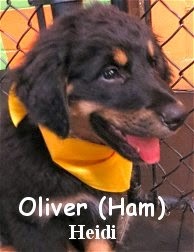 Checkout these two short and sweet clips of Oliver, playing with doggy-gals Miley and Georgie. Today we assessed the extremely good looking, Oliver. 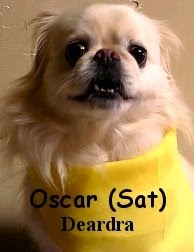 He is a six year old, seventeen pound, Pekingese. Oliver stayed with us in the Little Roll and did well. He didn't play a whole lot, but seemed very happy and content with his new surroundings. Oliver became excited when new dogs arrived and the pack grew. He's attended Dog Daycare before, so we believe he'll find his "groove" here, most likely playing more, given some time and consistency. This good lookin little fella should become a great Fort Fido "little roller". We hope to see Oliver bust out into some rigorous play, but if not, that's ok too. He is a great dog that is welcome to The Fort anytime. Lucky for us, we'll be seeing him again soon. Although he didn't cruise into The Fort in the Millennium Falcon... He did come in bright-eyed and bushy-tailed this morning. Meet Chewbarka, AKA, Chewby. He is a five year old, fifteen pound, white and gray colored, Shih Tzu. Chewby hung out with us upstairs, in Fort Fido's Little Roll. 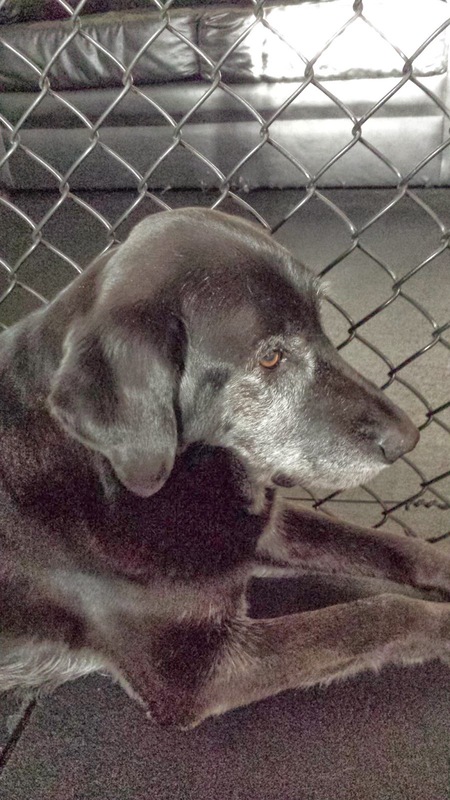 A Dog Daycare regular from Idaho, Chewby, enjoys the "daycare scene" and socializes quite well. He really seemed to like it here, once he knew there were other dogs coming in too. At first, Chewby just sniffed around and meandered with a few different members of the pack. After a while, French Bulldog pup, Miguel, showed up, and quickly became one of Chewby's playmates... The two scampered about feverishly for a time, getting in a good bit of "cardio" lol. All in all, Chewbarka had a wonderful time here this morning. We plan on seeing him back here again soon. What can dog brains tell us about humans? Props to, Breanna, for capturing some of the canine-fun. Here's a handful of great recent photos, a few from the other day and a few from today. Big Louis In The House! Emma looking as pretty as ever. It's "lights out" for Mr. Jackson, after a bit of early morning rough-housing. Here's a "precious one" with The Captain, and not Tennielle, but Theodore lol. Sister and brother, Lucy and Max, always get to playing hard with each other, and others, while they're here at The Fort. Big Rollers Beau and Odin, had a blast playing this morning. This morning, The Fort welcomed two chipper new recruits. Meet Hershey and Bodie! 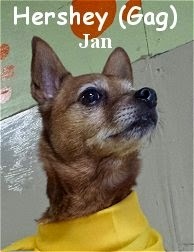 Hershey is a fit, fifteen year old, thirteen pound, Miniature Pinscher Mix. 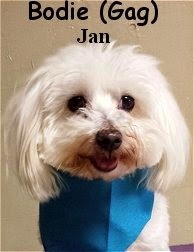 Bodie is a darling, five year old, thirteen pound, Maltese Mix. These two were just a whole lot of fun upstairs today. They waltzed into the lobby, then play area, with ease, as if they'd done it a million times before. They've been socialized very well over the years, and it shows. Hershey and Bodie have quite happy and fun-loving spirits. These two likeable canines socialized and fit into the pack right away. Thankfully, Fort Fido regular Seamus, sent Hershey and Bodie our way, and luckily, they all got to pal-up together this morning. Both Hershey and Bodie will make excellent additions to our Little Roll... Besides, they're darn right cute too! P.S. Boy did their pictures turn out good, swell job Zach! Here's a hillairous quiz for you, BuzzFeed's, Are You A Dog? Wonderulf Article, famous loyal dogs, & GIFs! Thank you to Julia, "Black Pearl's" owner, for bringing us in this wonderful New York Times article. It is titled "You'll Go Far, My Pet", and it is in the "Sunday Styles" portion of the newspaper. I have found it online, and you can read it here. It talks about all of the latest dog related things, in our new "digital-dog-age" (not to be confused with the "Alpo Era" lol), through the eyes of a new puppy owner. On talk radio this morning, I heard about some of the most famous "Loyal Dogs" ever. Although I couldn't find reference to it online... One dog, waited for it's owner, at a pub in Ireland, for years after it's owner had been hospitalized. When the dog died, the pub owner put a large picture of the dog's face up over the bar. The most famous "Loyal Dog", has got to be, Hachiko, from Japan. He and his owner, would greet each other every day, at the same time, at Shibyua Station, in Tokyo. One day, Hachiko's owner didn't show, he suffered a brain hemorrhage and died. Hachicko however, never stopped waiting for his owner's return. He continued to show up at the train station, everyday, at the same time, waiting for his owner, for nine years straight! What an incredible story. Once Hachiko finally passed away, the station erected a bronze statue in honor of him. That little story, reminded me of the Futurama episode "Jurassic Bark"... Hachiko's story most certainly inspired it. For some much needed comic relief today, especially after those stories, here's the "40 Greatest Dog GIFs of all time", for your viewing pleasure. Enjoy! Today, Zach, scored some great photos of a few Fort Fido regulars, check them out! We also captured two cute little clips from this morning's Medium Roll. It's Yuki, up to his usual antics, along with Avi, Lucky, and Olive. In clips, from this morning mainly. There was a lot of "love" in the Big Roll today. This is the day's Little Roll in a nutshell. Much of a blog post, however, it is an awesome picture of a "vintage dog trainer" at a circus hahaha! Reminds me of when, David (my dad), "wrangles" the Medium Roll. Definitely click it to enlarge the pic. All for now, more tomorrow. Today Fort Fido assessed Keoki. 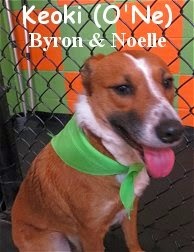 She is a striking, two year old, forty-five pound, Border Collie Mix. Headed to the Medium Roll, Keoki, wasn't sure what our place was all about at first. After getting back there and settling in, Keoki met with a few different canines. While meeting the others, she was relaxed, showing off good canine-communication skills. Keoki seemed to enjoy being here at The Fort and hanging with it's pack. 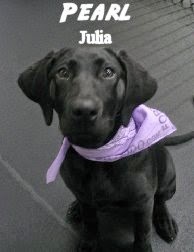 Although we didn't see her get into much "play", she's definitely social and comfortable with her newfound experience. We believe she will "bust out" into some play, in a future visit. We plan to see Keoki again, she is welcome to attend anytime. Early this morning, Fort Fido had Mimi in for her assessment. 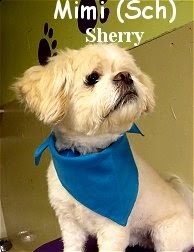 She is a fabulous, four year old, twenty-five pound, Havanese and Pekingese Mix. After partaking in a brisk morning walk, Mimi, pranced into The Fort with wonder. She was 110% ready to give our Little Roll a go. Up there, Mimi went right into fun! She "meeted & greeted" with every Little Roll pack member that entered the play area. She speaks very fluent "DOG", and enjoys making new canine-acquaintances. As far as fun is concerned, Mimi had a ton of it here, right off the bat. She happily played, even one on one, with several different dogs, Jesse, being her most favorite. It's really great to see a new dog so calm and balanced, and comfortable enough here, to play on a first visit. We really look forward to the return of Mimi, and hear that she may be trying an overnight stay soon. I'm quite sure she is going to love it! Here's, Mimi, falling head-over-heels for Jesse haha. We scored some great clips for your viewing pleasure today. In the Big Roll, Red and Theodore had one "raucous-reunion." The Medium Roll was alive and kickin' as always, especially early in the A.M. with Shirley and Yuki. Also, in the Medium Roll Play Area, we had the opportunity to bust out the "Herding Ball." Many dogs enjoy it, but today it was most definitely Jackson's favorite! Meet Tibi! She is a gracious, twelve year old, thirty pound, black and tan colored, Mixed Breed. 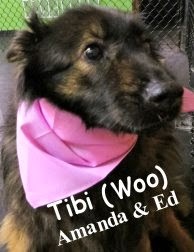 Tibi looks like she could be a mixture of Labrador Retriever, German Shepherd, and quite possibly, Chow Chow. For being an older, or shall I say, "more mature canine", Tibi, seemed surprisingly at ease with her new surroundings. She strolled with us to the Medium Roll, where she entered without much hesitation. Tibi acted cool, calm, and collected, while hanging out with the day's wily young pack. The majority of canines therein, being less than half of Tibi's age. We didn't see a whole lot of play or interaction out of Tibi, but that was to be expected. She's a sweet old gal that's welcome to The Fort anytime. Boy, she sure is a far cry from "little sis" Daisy, and her energy level. Haha! Do our dogs look and act like us more over time? Little Pearl's first "Vine" lol! A .GIF, "trying to be productive during PE." And last but not least, these rad little clips, taken yesterday, of Frenchies Oliver and Miguel. 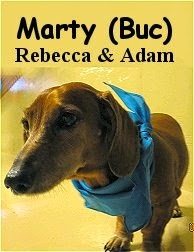 Get a load of this good-looking fella, Marty, that we assessed today. He is a chipper, ten year old, eighteen pound, red colored, Standard Dachshund. Marty breezed into Fort Fido this morning, upbeat and without a care. Even before getting upstairs to the Little Roll, he was happily sniffing about and wagging his tail. Once in the play area, Marty continued to explore his surroundings. Straight from the get go, he seemed pretty content with his new digs. As time went on and other canines arrived, Marty acted as if he'd already been hanging out with them lol. He wasn't overly concerned with playing or interacting much, yet he was social enough to stay calm and balanced around the group. It's not Marty's "first time at the rodeo" so to speak. He looks and acts quite spry for the mature, ten years old, that he is. He did well amongst the high-energy youngins', that make up the majority of the Little Roll's pack. Marty is welcome to attend The Fort whenever he'd like. Swell job my man, see ya soon! Welcome to "The Jungle" Axel! We've definitely got fun and games, or at least, lots of playmates for you. Hahaha! 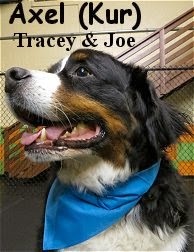 Meet Axel, he is a kind, five year old, 101 pound, Bernese Mountain Dog, who had his assessment this morning. Obviously, due to his size, Axel stayed with us and the pack, in The Fort's "Big Roll". He entered calmly and confidently, with a demeanor complimentary to his regal breed. It has been "Burner Madness" around Fort Fido lately, with the additions of Gertrude, Alice, and now Axel. Axel is truly just a big sweetheart. He has been socialized well, and it shows. Axel's idea of a good time here so far, is meeting the others, strolling around, "playing" just a little bit, and then chilling out. He is quite welcome here, and we hope he'll stop in again. Friend of Fort Fido, Zariah, has been a buddy of Axel's for awhile. Cool stuff! Axel sure is an awesome dog, but, thankfully, he doesn't have quite as much "energy" as the "Axl Rose" of the 80's lol. Ok, no, just "Jethro" lol! Jehtro's a handsome, three year old, sixty pound, gray colored, Weimaraner, who had his assessment this morning. A highly-social and athletic canine, Jethro, took to the Big Roll with excitement and ease. He has great canine-communication skills, and makes friends effortlessly. Within minutes, Jethro was playing hard with several different dogs. We are quite pleased to have Jethro here today, he makes a wonderful addition to the Big Roll's pack. Super job today Jethro, we will see ya around! 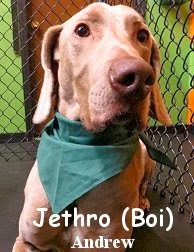 Checkout these two fun clips of Jethro having a blast here today... He really took a liking to Stasha, among others.